Free tram travel is to be offered to rail passengers affected by disruption. Edinburgh Trams will carry ScotRail passengers when the trains are not running. As part of a new agreement, when emergency repairs, signalling issues or severe weather stop trains running, people will be able to complete their journey by showing their ticket on board the tram. ScotRail said its staff would advise when this scheme is being implemented. Tram stops useful for rail passengers include St Andrew Square, Haymarket, Edinburgh Park Station and the planned Edinburgh Gateway stop. 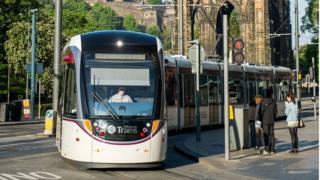 Transport for Edinburgh Chief Executive Ian Craig said he was pleased with the new partnership. He said: "Ours and ScotRail's commitment is to ensure customers receive the best possible service but there are external influences that can cause disruption. "It's our hope that by enabling passengers to use their tickets on the trams as well as trains, we will be able to ease the level of inconvenience caused when trains can't run as planned." Phil Verster of ScotRail said: "We always want to provide the best possible service for our customers but sometimes, due to severe weather or other external factors, that doesn't always go to plan. "When our services are disrupted, we do our best to keep our customers moving and this new ticket acceptance scheme with Edinburgh Trams will help us do just that." Scotrail passengers have been able to use their tickets on Lothian buses when trains are disrupted. There is already integration between between trams and buses in Edinburgh with the use of day tickets, and a travel pass known as Ridacard.